This grey kitten is carrying his brother on his back. As the song says, "he's not heavy, he's my brother". 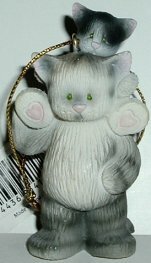 This hard plastic ornament is 2 1/2" high x 1 1/2" wide. Part of the Kenni Kats by Big Sky Carvers.